Traditional items such as playhouses, see-saws and swings still represent some of the most popular items in a play area. They provide both moving play experiences and opportunities to interact with other users. 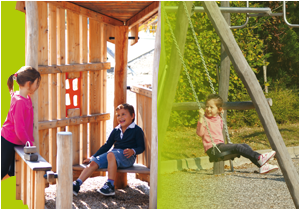 The size and design of these Robinia items enable users of all ages to experience a natural playground environment.